"Norway, a country in which social engagement is a way of life. We recognized it as soon as we arrived, at a discussion at the Nobel Peace Centre—we could not have dreamed of a better place—with representatives from a whole network of non-governmental organizations working in Norway and abroad. Supporting human development and defending rights and freedoms, justice and peace, children and youth, and equality and security, is at the heart of their activities. Norwegians have a highly developed sense of civic responsibility: 84 per cent of the population volunteer and are members of one or more NGOs! This dynamic social fabric is phenomenal and shapes the Norwegian spirit at every level of society. The remarkable presence of Their Majesties King Harald V and Queen Sonja, Prince Haakon Magnus and Princess Mette-Marit at several of the forums we organized with the public, and the extent to which they listened, were eloquent reminders of their involvement. For this, they are very loved and respected by the people of Norway." — Michaëlle Jean, May 2, 2009. Her Excellency the Right Honourable Michaëlle Jean, Governor General of Canada, along with her husband, His Excellency Jean-Daniel Lafond, conducted a State visit to the Kingdom of Norway, from April 28 to 30, 2009. Their Majesties King Harald V and Queen Sonja of Norway accompanied Their Excellencies throughout the State visit, which helped to further develop bilateral relations between the two countries. The visit underscored the shared values of Canada and Norway, including the importance placed on finding a fair balance between economic development and environmental protection, and the priority we give to education and youth engagement. This State visit also provided an opportunity for Canada and Norway to pool their expertise on Arctic development and northern populations. At the Oslo International Culture Museum and in the presence of His Majesty King Harald V of Norway, Her Excellency hosted a Youth Dialogue on diversity with non-governmental organizations and students. Cultural performances were presented by Norwegian and Canadian artists. The Governor General delivered a speech and invited young people to express their views on the issue. Oslo, Avril 2009 — State Dinner hosted by Their Majesties of the Kingdom of Norway at the Royal Palace, in Oslo, followed by a Youth Dialogue on diversity at the Oslo International Culture Museum, where the Governor General delivers a speech and invites young people to express their views on diversity. Le 29 avril 2009, forum Le point des arts sur le thème du soutien des arts aux collectivités locales, à Oslo, en Norvège. In the presence of Their Majesties King Harald V and Queen Sonja of Norway, Their Excellencies presented at the Litteraturhuset (House of Literature) in Oslo a public Art Matters forum on the theme of “How do the arts sustain local communities?”. His Excellency Jean-Daniel Lafond lead a panel for the forum exploring current Canadian-Norwegian approaches to arts bridging geographic and cultural distances. Le 30 avril 2009, à l'Université de Tromsø, discussion avec les autochtones Sâmi du Nord de la Norvège. 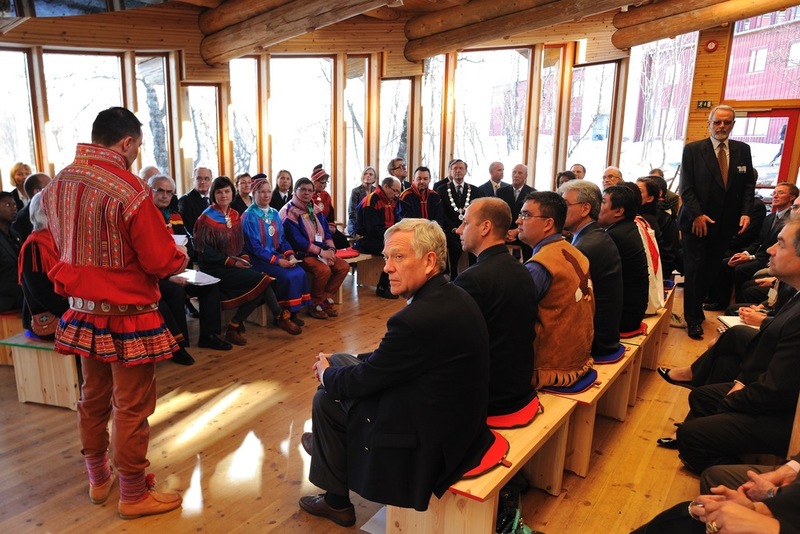 At the Àrdna Cultural Centre, University of Tromsø, Their Majesties King Harald V and Queen Sonja of Norway joined Their Excellencies in a discussion with Sámi leaders and others to learn more about the centre for Sámi Studies’ unique Indigenous studies programs, as well as the University of Tromsø, the world’s northernmost university.